I have included 19 case studies to share best practices about how to build a successful IoT business. I am blessed by the Foreword by Brian Solis and Epilogue by Rob Van Den Kranenburg of EU IoT Council. I have organized this book into five parts. See below to get a feel for what is included in this book to make it the definitive source about how to build an IoT business either a new one or to extend an existing business. This book is organized into five parts. Part I covers the strategic approach to building an IoT Business from a technology idea. This section is particularly important for Product Strategists and Product Managers. It covers how to extend an existing business using IoT or create a new business. You will also learn to optimize the Customer Experience across multi-device customer touch points. Part II offers an in-depth look at Internet of Things applications ranging from consumer applications such as wearables, smart cities and connected cars to industrial and manufacturing applications. This is a methodical discussion of challenges and best practices in building and launching IoT applications with case studies of current IoT Businesses. In this section, you will also learn what is ‘Machine to Machine’ (M2M). Part III covers disruptive innovations from Internet of Things across industries and the evolving best practices of value creation. In this section you will get an in-depth analysis about top three industries healthcare, retail and education. We will look at proximity sensors (Beacons) and the difference between Beacon deployment standards for iOS and Android and a case study on the application of beacons by several global retailers in stores, malls and airports. Finally you will be introduced to innovative disruptions impacting product brochures and education industries making the transition from paper to electronics using IoT to bridge the gap. Part IV will cover technologies that make up the IoT ecosystem that have a strategic impact on the business you build. 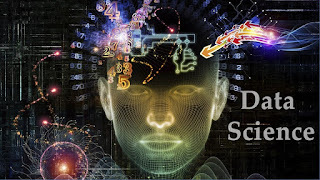 I cover Big Data, Predictive Analytics, Data Science and how value is created from IoT data. This is a fast growing area of IoT adoption and you will learn methods as well as data applications that you could apply to your business. Part V is about the future of IoT. First we start with a section on IoT jobs. Then, I will share mind-blowing examples that are pushing the human machine boundary with the merger of IoT and Artificial Intelligence and affective computing. I will cover Bio Payments and Augmented reality. I hope you derive inspiration as much as knowledge from this section. If this book is for you, I'll appreciate if you can share a review on Amazon. If not please share it on Twitter or LinkedIn or Good Reads to others who will benefit from this. I am excited as I am building out the curriculum for my new in-campus course I am getting ready to teach at Stanford Continuing Studies Program for adults. Breaking down IoT Products as Business Applications. I'd love to hear your questions/thoughts if you are a prospective student considering this course or if you have passion in this topic and have ideas of case studies I should include in this program or my upcoming print book "The Internet of Things Business Primer". I love the junction of Product and Data. Internet of Things creates value at that perfect junction making it exciting for me. IoT is about making ordinary things all around us smart by adding sensors and giving it Internet access. These sensors keep collecting data. It could be the temperature inside your home, oven, our bodies, or in a steel plant or many other sensor data for motion, luminescence, touch, acceleration, humidity etc. The sensors collect this data at a repeat frequency creating a vast pool of data. In simple cases the sensor can check against a preset level and take some action. Turn on the sprinkler if the temperature is above a certain threshold. Notify the granary owner if the humidity of stored wheat is above a certain safety level. Send me an alert if my garage is left open for longer than five minutes. As I play with more IoT products and engage with entrepreneurs solving customer problems I am increasingly fascinated by the power from processing IoT Data and the many ways value is created from this data. Ajit Jaokar was the first person who introduced me to the power of Data Science and IoT. He has taught at Oxford, is based in London and offers online classes customized to anyone who wants to learn this topic either to solve a complex data problem for their business or to enhance their careers in IoT Analytics. In simple cases, one can look at IoT data and analyze for patterns to build predictive models. This is used by Boeing and many manufacturing plants to monitor health of equipment to predict failures to do preventive maintenance. Instead of rule setting you could apply Machine learning and now the horizons open up. Machine Learning involves training a model by feeding it data to make predictions against a performance measure. Nailbot is a robot that offers manicures for teen girls and uses machine learning to adapt to nail sizes of the girls. ProGlove, an industrial wearable uses machine learning to predict any quality glitches in a manufacturing process. Ajit is passionate about the idea of applying deep learning to smart city scenarios. Imagine being in a crowded stadium or 4th of July parade and if a parent gets separated from a child, its a nightmare to locate the child. Deep learning of the video footage can apply the algorithm similar to the one Apple or Google or Facebook use to identify faces in photos to predict where the parent and child are in the crowd in real time to help bring them together. Ajit is offering the 3rd cohort of his Deep learning and IoT class onsite for Londoners or Online for everyone else (across time zones) and the next batch starts on Nov 10th - Details here. 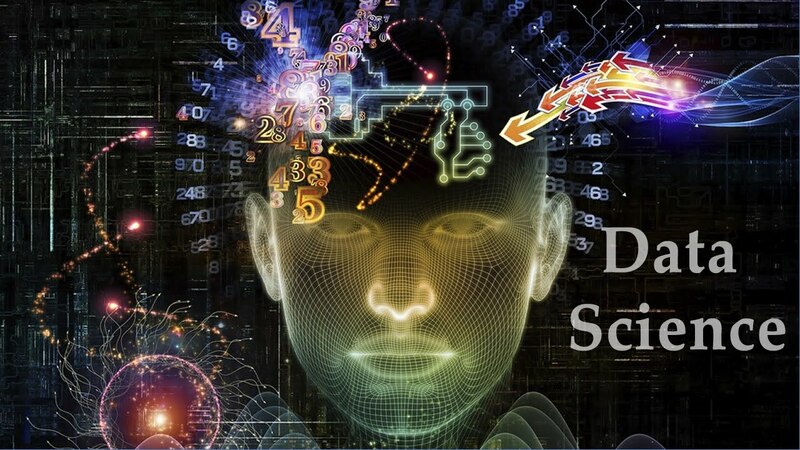 I would love to hear your comments below if you have taken Ajit's Data Science and IoT course or if you have questions/comments/skepticism about how real is IoT and Data Science or if you are using Data Science for your IoT product to do something fascinating. Sudha Jamthe is the author of the Amazon Kindle book "IOT Disruptions" anda Mobile & IoT Product and Business Leader who loves playing with IoT and data to figure out whether we can build products to change the boundary of human and machines. She is an innovation advisor for Blockchain University and Barcelona Technology School. Join her weekly video show The IoT Show for analysis with global guests about innovations in Internet of Things. Amazon owns 1-click shopping on the web. So its not a surprise for Amazon to make our long-due dream of making our household appliances smart - with 1-click push of a button. The Amazon Dash Button launched today! The product person is me is impressed by the design of the slick button, the tap of the button synonymous to the 1-click action we associate with Amazon brand and how it reduces friction in purchasing non-fun essential items like soap, coffee, garbage bags, printer paper, shaving cream and diapers. And it seamlessly extends Amazon's commerce business right into our home. Have you seen Flic the Wireless Smart Button on IndieGoGo? This is a generic 1 click IOT button a startup is planning to build. Watch the video, it is hilarious! Amazon offers the IOT device, the App, the platform and owns the inventory of the brand consumables. So they are able to offer a seamless frictionless experience for the consumer setting it up for success. It looks like the button is a Bluetooth device that communicates with Amazon App on your smartphone and uses the Phone's connection to order online. Amazon is giving a custom button for each brand so it simplifies it for consumers to order particular consumables. So you get a button for Tide and stick it to your washing machine and another button for your coffee maker. Each Bluetooth device has a unique Mac address. When you set it up first time, it will tie to your Amazon identity and let you configure (I am guessing here) some sizes/quantity/type of the item to get to a particular SKU in Amazon's catalog. Subsequently when you press the button it tells the App to order that item and sends an alert giving the user the freedom to cancel the order. Once you order the item, subsequently the order tracking comes via mobile alerts using Amazon app. This is comparable to alerts from shopping sites on Messenger Platform that Facebook launched last week at their F8 conference. The beauty of IOT devices compared to all tech innovations of the past is how we are seeing simplicity in design and the good ones tie seamlessly to a mobile App. Amazon Dash Button is a simple button you can stick anywhere on any appliance to remind you to order the refills. It ties to the Amazon App and allows you to cancel your order giving user the choice to do comparison shopping. This is such a subtle feature that builds trust with users challenging them that Amazon has the best price. It builds on Amazon's delivery convenience. It offers features to track the purchase which all ties back to existing Amazon App. Why this is win for Amazon and not any Retailer? Amazon owns the distribution of Prime customers where they have solved for the delivery problem. Any other retailer will have the problem of on-boarding users to adopt a new technology. And this ties seamlessly to Amazon's inventory (for most cases). So they are deploying it for Prime Customers only at launch, thereby strengthening the value of Amazon Prime memberships. You know I love new innovations but also become schizophrenic trying to look at other sides of every product roll-out. That's the best part I love working with many different teams with multiple, smart viewpoints. The analyst in me wonders what Amazon data says (we'll never find this out) about the buying habit of people who buy consumables online. Do we go to Amazon to buy Diapers and end up purchasing lots of other stuff merchandized to us? Now will there be any cannibalization of such spending from users? It is possible that some product manager inside Amazon looked at this data and said, this is still the right thing for the customer so lets do it and went ahead. Maybe they estimated the upside from the scale of new purchases from the Dash button and the increased trust from Prime customers offsetting this loss (if any). Amazon offers a Platform API for device manufacturers called "Dash Relinquishment Service" to connect to leverage Amazon's authentication and payment systems, customer service, and fulfillment network. Whirlpool plans to offer re-ordering detergent. Brita is planning a connected water filter that will measure water usage and re-order filters. Quirky is planning a new connected device series called Poppy that offers a Pet food dispenser, baby formula maker, pour-over coffee maker that can measure usage and refills. Brother Printers will re-order ink cartridges and paper refills. All of them plan to use Amazon's DRS service to seamlessly order from Amazon. Amazon has left control with manufacturers to decide if they want to build in an Amazon Dash like button in their device or bake the counting of usage and ordering refill automated inside the device so they can manage their own design for their brands while using DRS. Are you as excited as me about this progress in IOT and Commerce? Share your thoughts in comments below. F8 2015 Launches - Messenger for Commerce, Parse for IOT and Drones for Internet.Org - What more can you ask? F8, Facebook's annual developer conference shows a glimpse of Facebook's innovation for its own products and for its ecosystem of entrepreneurial developers and marketers. This year's F8 (Mar 25, 26) top announcements are Messenger Platform and support for Internet of Things to connect to Facebook. Mark Zuckerberg shared a vision of how Facebook is now a set of apps on mobile and his team presented different innovations upon different Apps. Messenger and Parse for IOT ( Day 1) and Drones for Internet.org (Day 2) are the top announcements that excite me most because of the beautifully designed products and strategic business opportunities. Here's a 3 min summary of Day 1 #F8 announcements. Read on as I share what it means for you as a user or as a business. David Markcus made this *huge* and strategic announcement! Messenger has opened up APIs for developers to connect their Apps to Facebook Messenger App. A. Messenger can call other Apps seamlessly from inside Messenger which allows users to share fun content like customized videos. This will allow us to create multi-media content (video, modified pictures or fun annotations in video or pictures) using other apps and share within messenger. The receiver will see the content but also a link for the app that was used to create the content. This is similar to Applink, the deep-linking capability Facebook added last year. But this is very strategic for Facebook's business because now they can help other App developers download more of their apps right from messenger (like they offer with Mobile Ads) and can monetize it. Another subtle implication of this brilliant design is how Messenger will show top apps to create new content for users. This is like Firefox showing a search box and can decide which search engine they show as the top choice driving traffic to that search engine. Now Facebook can impact the ranking and distribution of Apps in that category or decide on a ranking algorithm or charge for App developer to get more downloads and clicks. B. Messenger can communicate to Businesses. This has a huge Commerce implication and also a strategic shift in Customer Support facilitating 1:1 interaction with customers after a purchase. When you buy a jacket from Patagonia, you now choose to receive the receipt via messenger. Then you can refresh the same message to track the purchase and delivery of the item. From a product design perspective this means that the business becomes your 'friend' on messenger and now has a 1:1 channel to communicate with you, their customer. This brings a huge business opportunity for Facebook to monetize this traffic, engagement, customer support and influencer referral channels with businesses. I am so excited about this!!! I'll play with the new Messenger Platform options and write a separate article. Facebook is building Drones for remote locations to hover at 60000 feet and provide Internet access. What this means -This is exciting because of the goodwill of bringing internet access to remote locations. Also the sheer audacity of the idea and execution is exciting showing us that Facebook has innovative people and gives them room to execute their ideas taking us on the ride with them and building trust on all their other offerings as an innovative technology company. Here's the Internet.org video showing the drones. Ilya Sukhar announced Parse for IOT (Internet of Things). They offer a library for IOT devices and underlying chips of IOT like arduino to talk to Facebook's Parse platform to send notification alerts. Parse offers notification for mobile apps. Notifications are the alerts that reminds us about products we wanted to buy, games where our friends have out smartened us and email and message reminders, all bringing engagement back to Apps. Now developers can use the Parse IOT library and send notifications from Internet of Thing devices to Facebook apps. IOT devices have several sensors which send alerts to companion apps. This offers the alert platform and saves developers the trouble of building this server side component. This also offers a whole new feeds channel for Facebook and ties developers closely to Facebook via the Parse Platform. e.g Chamberlain App offers an IOT for your garage that can send an alert when the garage is open. App developers will have a single dashboard to see Ad campaigns results across all apps and all devices with detailed analytics. Developers can understand how people in aggregate are using their Apps and make informed decisions on targeting users, or improving app product flow. For example cross device online Retailer Zulily is a Facebook beta partner. They found that for every 10 men and 10 women coming in 4 women add items to cart only 2 men added items to cart, then both men and women get the same purchase conversation from that step forward. This is analytics provided by Facebook. Zulily can use this insight and decide whether to add more inventory for men or focus marketing on women or take a different action to drive more revenues to their business. Facebook comments on sites and on Facebook will continue seamlessly with a new Comments Plugin for websites. We log onto several web sites and mobile apps using Facebook Login. The conversation on an article stay on the web site, different from conversation on Facebook on the same topic. Now the conversation on a site (where we login using Facebook) will continue under the article shared on Facebook. This is a complex piece of privacy logic that Facebook has implemented seamlessly. A comment on the web site will show up on Facebook for all to see. A users' comments to articles shared by friends in Facebook will show up on the site only if they allow for public sharing else it will be visible on the site only for their friends or friends of friends based on their setting. This is a useful feature and a complex one to create a seamless user flow, so it is a good win for improved user experience from Facebook. This is good for marketers as the conversations will not be fragmented and they can check holistic engagement of users. Zuckerberg shows a futuristic sneak peak of spherical video taken using 24 cameras saying we can such videos on Facebook in the future. The announcement was about the capability to share Facebook videos on external web sites. We can now share Facebook videos one external web sites similar to how we can put YouTube videos or Vimeo videos on our blogs or websites. Users share 3Bil videos shared every day on Facebook. This will create more video views and inventory for Facebook to potentially sell video Ads competing with Google. Last year Audience Network launched for apps to monetize Apps. LiveRail also part of Facebook, will manage mobile banner ads. Facebook calls it 'People based approach' to monetization of user's audience network. Its a crazy and fun day to be a Tech consumer!!! Meerkat (launched last week in SXSW) and Periscope (launched today Mar 26th) offer live video recording making anyone into a TV broadcaster. The funny one for me was this guy from Mexico who was talking non-stop and switched topic to whatever words we typed in comments. He was talking about bald head, dinosaurs as pet, and I said 'dry beans' and it was so hilarious to see him switch the topic and he said "Dry beans... Are ... Not Wet. The difference between dry beans and wet beans is ... moisture ...."
Ruth Reader of Venturebeat has done a nice feature comparison between Meerkat and Periscope. I like having two options. Competition is good and will help drive good product features for both. It is early early days! Periscope archives the videos for 24 hours while Meerkat does not. Periscope sends a stream of hearts allows us to click the hearts and the broadcasters line up hearts building a Leader board. Meerkat has a intuitive easy interface allowing us to find twitter friends to follow and I got 76 followers even before my first video but ran into crashes. Periscope got my video stream working right away after a minor audio hiccup. Periscope is now owned by Twitter so they cut out Meerkat's Twitter Social Graph access. Both have no parental control or ways to tag or access or search videos live or archived. Yet. Both teams will iterate in typical silicon valley style (Meerkat is an Israeli startup) to understand who their real customers are what are the use cases to build upon. 1. Citizen Journalism On a serious note, a building explosion in NY injured 30 people today. Persicope video streams starting sending notifications live from the scene instantly creating so many citizen journalists. Ben Popper of TheVerge wrote about how he saw periscope live video of the fire and his thoughts on evolving citizen journalism. 2. P2P Video Communication In theory this is like Google hangout but with a super cool social interface. So people could use it for video communication of families, friends, events from around the globe. Meerkat looks like a video version of Snapchat as the videos are not archived but there is the added angle of 1 to many streaming adding interesting possibilities. 3. Real Time Events coverage/Activism We cannot forget the fact that both of these apps are riding on Twitter so the benefit we are seeing is all that we have seen and experienced on Twitter. Activism, Events live stream bring global news and communities together. People sharing live traffic updates etc are all common on Twitter now available in video format as the world is moving to videos. 4. Distance Education I am going as a judge to UCSC "Social Partners" class on Saturday and plan to live stream the students final presentations (hopefully students will be ok with it). Live videos of educational seminars, classes are low hanging fruits. Khan Academy was built on the backbone of YouTube, wonder if there will be a real-time version of it next? 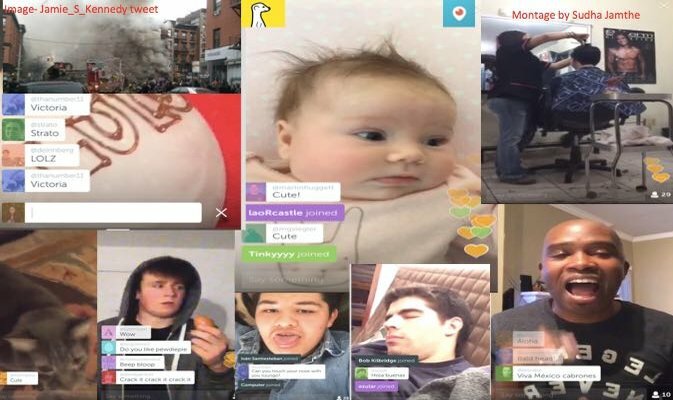 The sheer diversity of possibilities and crazy ideas and being able to see the world from the eyes of so many others is the most fun, intoxicating part of this new real-time video broadcast from our mobile phenomenon. Periscope founders in an interview to Product Hunt, the product launch site have said a developer API is coming soon. You can catch the periscope video of the interview for 24 hrs only from the interview link. Do you remember Qik, they came up with the same concept of real time video recording on iPhones before iPhone officially supported videos and allowed us to upload to youtube and several sites as an option. I used to have a channel on Qik and record local Silicon valley events and video interviews live. Qik sold for $100Mil to skype in 2011 and Skype absorbed the video cloud platform technology and shutdown the consumer app in April 2014. Qik connected to many different carriers globally and had amazing features like video between two phones and store recordings for live watch by followers on the web. Another one is justin.tv when Justin Kan built a camera he wore on his head and livestreamed his life and scaled it to a Y combinator company (also 2007). Part of me is nostalgic but if you are someone who has seen the Phoenix like rebirth of technologies you will share my optimism that the Qik team must be using their learning of technology problems solved to create some other innovation and the new Meerkat and Periscope teams will do something different with fresh new minds and we as consumers will find some different killer apps aligned with times today. Let me know if you have tried Periscope or Meekat, Share your thoughts and some use cases you see evolve.